The War of 1812 brought us together as a nation, and left us with icons that remain symbols of our unity today – among them, the Star Spangled Banner and the USS Constitution. Authorized for construction by George Washington, Constitution was one of the first six ships in our United States Navy. The world’s oldest commissioned warship afloat, it was during the War of 1812 that she earned her famous nickname, Old Ironsides. Constitution‘s victories proved that we could defeat the best of Britain’s Navy and protect our national interests. The war established our country as one to be recognized, reckoned with and respected. 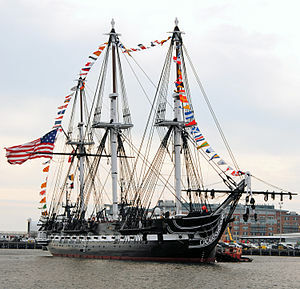 The name “Old Ironsides” stuck, creating one of the most enduring legends in the history of U.S. military. Constitution went on to defeat Guerriere; during the remainder of the War of 1812 she defeated 4 other British warships and captured many merchantmen as well. Following the war, Constitution remained in active service through the 1820’s. Built in an era when a wooden ship had an expected service life of ten to fifteen years, Constitution was now thirty-one years old. The Secretary of the Navy requested a routine order for surveys of ships held in storage dockside. On 14 September 1830, an article appeared in the Boston Advertiser that erroneously claimed the Navy intended to scrap Constitution. Two days later, Oliver Wendell Holmes’ poem “Old Ironsides” was published in the same paper and later all over the country, igniting public indignation and inciting efforts to save “Old Ironsides” from the scrap yard. Over the years since the 1830’s, Constitution has been restored many times. Constitution emerged from the most recent three-year repair period in November 2010. 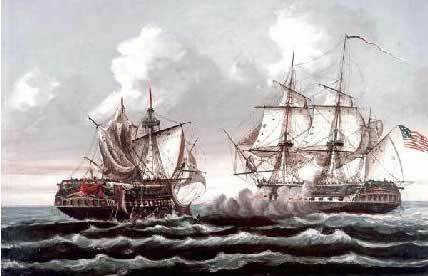 The restoration continued the focus toward keeping her 1812 appearance by replacing her upper sides so that she now resembles what she looked like after her triumph over HMS Guerriere. Constitution‘s crew and commanding officer, Commander Matt Bonner, are preparing for bicentennial observances of the War of 1812 and again will sail Constitution under her own power. Constitution‘s stated mission today is to promote understanding of the Navy’s role in war and peace through educational outreach, historic demonstration, and active participation in public events. As a fully commissioned US Navy ship, her crew of 60 officers and sailors participate in ceremonies, educational programs, and special events while keeping the ship open to visitors year round and providing free tours. The officers and crew are all active-duty US Navy personnel and the assignment is considered special duty in the Navy. I have always had an unwavering support for our military, which probably can be traced back to my father’s service in the Army Air Corps at the end of WWII as well as hearing stories from a neighbor who was a veteran of WWI. As a young boy, I had a particular fascination with the US Navy, reading and studying about it. Of all that history, the long and rich heritage of the USS Constitution has captivated me the most. Old Ironsides is setting sail once again at 11:00 today in Boston Harbor on the 200th anniversary of one of her most significant victories, a proud symbol of freedom and the United States of America. This entry was posted in Family Matters and tagged Old Ironsides, USS Constitution. Bookmark the permalink.